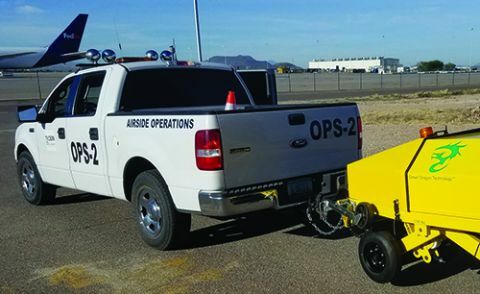 Last fall, the Arizona airport purchased its own continuous friction measuring equipment to enhance operational safety and boost the efficiency of its ongoing rubber removal efforts. If not removed, rubber residue left behind by aircraft tires during landing eventually will impede aircraft braking and control, with potentially catastrophic results. “We can maintain our runway at a better value for a longer period of time, and more accurately evaluate runway safety conditions,” explains Marc Gomez, director of Airside Operations at TUS. Friction Testing Equipment: 2018 NAC-Dynamic Friction Tester, from Neubert Aero Corp.
Because the FAA does not actively enforce friction testing rules, many airports do not adhere to the standards until there is an incident that forces the issue, says Tim Neubert, president of the International Friction Pavement Association and president of Neubert Aero Corp., which manufactured TUS’ equipment. TUS took the initiative to keep airport users safe on its own accord, he emphasizes. Regulations are in place to make sure runways are safe for pilots and passengers, but there are no penalties for failing to comply with the regulations, he adds. By Neubert’s estimation, there are less than 100 pieces of continuous friction measuring equipment at all 2,800 commercial service airports in the United States. Previously, TUS cleared its runways of rubber residue three to four times a year based solely on visual inspections and a general sense that it was time for upkeep. “We really could have applied this benefit a couple years ago, but it works out good now,” says Gomez. The friction tester purchased last fall allows TUS to evaluate the status of runways objectively and eliminates guesswork regarding safety limits, explains Neubert. The unit measures traction on runways and the operator then sends data to the control tower, which then relays it to pilots before they make their final approaches. The data also tells maintenance crews when it is time to remove rubber residue. Frequency for friction testing is based on the average mix of turbojet aircraft operating on a particular runway, as outlined in FAA AC 150/5320-12C - Measurement, Construction, and Maintenance of Skid Resistant Airport Pavement Surfaces. Testing is also required immediately after rubber removal to evaluate whether friction values have increased accordingly. Many airports rely on their rubber removal contractors for friction testing—a practice Neubert and others advise against due to the potential for a conflict of interest. Having the same company test whether its removal services are needed could raise questions about the objectivity of its test results, he explains. TUS purchased a standard tow-behind NAC-Dynamic Friction Tester in November 2017 for $58,000. Company personnel note that it is one of only a handful of friction testing units certified by the FAA for airport use. Choosing a tow-behind unit rather than a dedicated testing vehicle boosts operational flexibility, because vehicle components are more likely to need service than the actual testing equipment, says Neubert. Now that TUS owns its own friction testing equipment, there is no need to outsource the job to a contractor. At an average cost of $1,800 per runway, that would have amounted to $5,400 to $7,200 per year, reports Neubert. He also estimates the airport has saved hundreds of thousands of dollars in planned but unneeded rubber removal. Staff members at TUS received two days of training with their new equipment—one day of classroom presentations about friction testing and another day of hands-on sessions to learn about the unit’s specific features. “You need qualified operators trained by the manufacturer for generating and disseminating results to pilots,” says Neubert. Gomez and his crew took delivery of the new testing equipment just as the airport was reopening its main runway after a six-week closure for resurfacing. 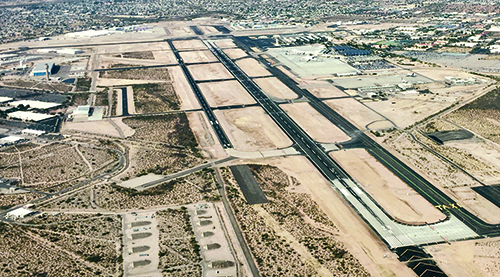 The recent runway improvements gave officials another reason to invest in equipment to maximize the lifecycle of a key airfield asset, says Gomez. For more information about continuous friction measuring equipment, our Industry Insider column from John O’Callaghan of the National Safety Transportation Board.